This is a List of National Historic Landmarks in Ohio and other landmarks of equivalent landmark status in the state. The United States' National Historic Landmark (NHL) program is operated under the auspices of the National Park Service, and recognizes structures, districts, objects, and similar resources according to a list of criteria of national significance. There are 76 NHLs in Ohio and four additional National Park Service-administered areas of primarily historic importance. Ohio's National Historic Landmarks are distributed across 37 of the 88 counties in the state. With fourteen NHLs, Hamilton County has more than any other county. 39°06′09″N 84°30′12″W﻿ / ﻿39.1025°N 84.503333°W﻿ / 39.1025; -84.503333﻿ (Baum-Taft House) Hamilton Taft family home now an art museum; designated for landscape murals by African-American artist Robert S. Duncanson. 39°05′25″N 84°30′34″W﻿ / ﻿39.09039°N 84.509571°W﻿ / 39.09039; -84.509571﻿ (Covington And Cincinnati Suspension Bridge) Hamilton, OH and Kenton, KY John A. Roebling's suspension bridge here was dramatic new design. It set precedent for Brooklyn Bridge later. 40°01′16″N 80°44′17″W﻿ / ﻿40.02111°N 80.73805°W﻿ / 40.02111; -80.73805﻿ (DONALD B (Towboat)) Belmont The Donald B. was built in 1923 and is the only 1920s unchanged diesel sternwheel towboat left in the United States. It still operates towing barges in the Ohio River. After years of being located in Switzerland County, Indiana, its home port was moved to Bellaire, Ohio in 2012. 40°04′40″N 84°13′00″W﻿ / ﻿40.077902°N 84.216666°W﻿ / 40.077902; -84.216666﻿ (Eldean Covered Bridge) Miami Only one of twelve long truss bridges still intact. It is considered to be the most structurely intact. 39°43′13″N 84°10′34″W﻿ / ﻿39.720416°N 84.176224°W﻿ / 39.720416; -84.176224﻿ (Hawthorn Hill) Montgomery The Orville Wright mansion. 41°09′00″N 81°20′40″W﻿ / ﻿41.15°N 81.344444°W﻿ / 41.15; -81.344444﻿ (May 4, 1970, Kent State Shootings Site) Portage Site of May 4, 1970, shootings of Vietnam War protesters by Ohio National Guardsmen that killed four. 38°45′04″N 83°50′32″W﻿ / ﻿38.751111°N 83.842222°W﻿ / 38.751111; -83.842222﻿ (John Rankin House) Brown Home of John Rankin, abolitionist. 41°21′55″N 82°41′01″W﻿ / ﻿41.365141°N 82.6837°W﻿ / 41.365141; -82.6837﻿ (Spacecraft Propulsion Research Facility (B-2)) Erie the world's only facility capable of testing full-scale upper-stage launch vehicles and rocket engines under simulated high-altitude conditions. 39°42′26″N 83°53′25″W﻿ / ﻿39.707252°N 83.890227°W﻿ / 39.707252; -83.890227﻿ (Colonel Charles Young House) Greene Now the Charles Young Buffalo Soldiers National Monument. 40°36′47″N 81°25′18″W﻿ / ﻿40.613056°N 81.421667°W﻿ / 40.613056; -81.421667﻿ (Zoar Historic District) Tuscarawas Only permanent home of the Society of Separatists in the United States. National Historic Sites, National Historic Parks, National Memorials, and certain other areas listed in the National Park system are historic landmarks of national importance that are highly protected already, sometimes before the inauguration of the NHL program in 1960, and are then often not also named NHLs per se. There are seven of these in Ohio. The National Park Service lists these seven together with the NHLs in the state. The James A. Garfield National Historic Site, the William Howard Taft National Historic Site, and the Charles Young Buffalo Soldiers National Monument are also designated as NHLs and are listed above. The remaining four are as follows. Hotel Breakers March 9, 1987 August 7, 2001 Sandusky Erie Significantly altered in 1999. Rocket Engine Test Facility October 3, 1985 May 4, 2005 Cleveland Cuyahoga Demolished in 2003. Benjamin F. Wade House December 21, 1965 1968 or 1970 Jefferson Ashtabula Home of Civil War-era politician Benjamin F. Wade; demolished c. 1968. ^ National Park Service. "National Historic Landmarks Program: Questions and Answers". Archived from the original on 2009-06-06. Retrieved 2007-09-21. ^ National Park Service (June 2011). "National Historic Landmarks Survey: List of National Historic Landmarks by State" (PDF). Archived from the original (PDF) on 2011-11-05. Retrieved 2011-07-04. .
^ "Donald B. (Towboat)". National Historic Landmarks Program. National Park Service. Archived from the original on 2011-06-05. Retrieved 2009-06-05. ^ Contact Us, Historic Preservation Society [former owner], n.d. Accessed 2012-06-24. ^ These are listed on p.115 of "National Historic Landmarks Survey: List of National Historic Landmarks by State", November 2007 version. ^ Date of listing as National Historic Site or similar designation, from various sources in articles indexed. ^ National Park Service (June 2010). "National Historic Landmarks Program: List of National Historic Landmarks by State" (PDF). Retrieved 2010-07-26. ^ a b c "Withdrawal of Designation: Benjamin F. Wade House". National Park Service. Retrieved 2015-04-13. 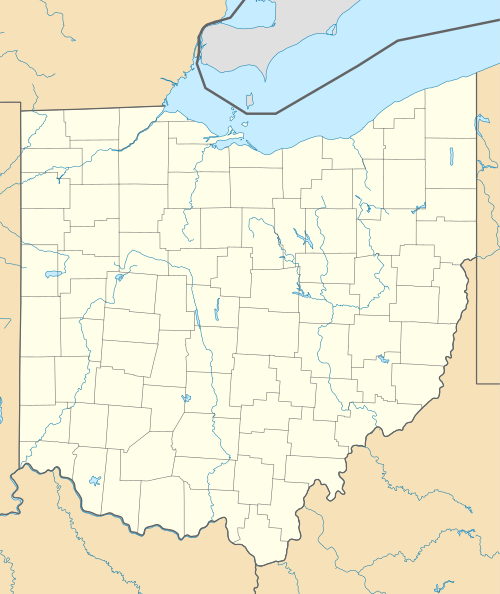 Wikimedia Commons has media related to National Historic Landmarks in Ohio. "National Historic Landmarks Survey: List of National Historic Landmarks by State—South Carolina (77)" (PDF). National Park Service. Retrieved 2007-11-05. .